Bathroom renovations or improvements should always be done with safety in mind. Focus on improving specific areas in the room, like the shower, to reduce the risk of lavatory injury. 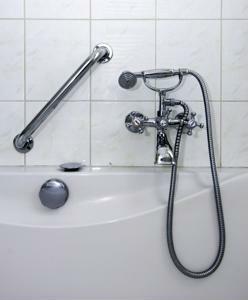 The area in the bathroom that likely sees a fair share of slips and falls is the shower. Even the most graceful people have probably experienced a blunder getting in and out of this fixture. To avoid these incidences, Better Homes and Gardens suggests making the shower separate from the bath, claiming that the majority of bathroom-related accidents happen when people climb over the edge of the tub to take a shower. Following this advice may be an opportunity for you to invest in an updated fixture. A steam shower will instantly enhance your facilities. The showers come in a variety of styles with a selection of features. Choose yours based on its amenities as well as its safety. Find a shower with just a small step to get into it. Also, rather than having slippery ceramic bases, many of these fixtures have wood-paneled floors. A Houzz article notes a few other ways to make the shower safe. One of these is by putting a grab bar on the wall of the fixture. Rather than installing an industrial-style silver bar, the source suggests an oil-rubbed bronze piece, to keep your lavatory stylish. Also, seating in the shower adds to its safety. This way, rather than performing a balancing act when shaving your legs, you can sit down to get the job done. Luckily, built-in seats are typically standard in steam showers. The shower isn't the only place where accidents can happen. Overall, avoid installing any steps in the bathroom. Keep an absorbent mat with a slip-resistant backing next to the shower to dry your feet and stop any extraneous puddles from forming on the floor. Additionally, limit the number of sharp angles around the bathroom. Make sure your vanity doesn't have jutting corners: You may even be able to find one with rounded edges. When putting your medicine cabinet on the wall, make sure the corner of its door doesn't swing out at eye-level. With these things in mind, you'll be able to safely navigate through your newly designed lavatory.